In 2008, the investment world was turned upside down. The consequences of the global financial crisis leading to the recession have now resulted in low-interest rates, low growth and even lower returns. The generation who graduated during this credit crisis? 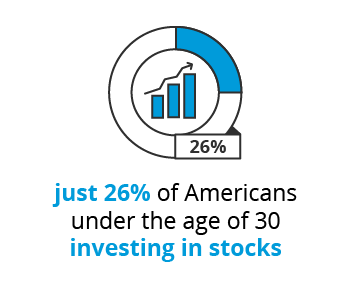 Millennials – many of whom have seen their parents or grandparents lose all of their hard-earned retirement savings in the stock market. “The stock market crash, and doom and gloom has scared some of us”, says Shannon Lee Simmons, a 30-year-old Toronto-based certified financial planner and founder of the New School of Finance. But now is the most important time for Millennials to empower themselves to confidently invest. Unfortunately, many Millennials will still be in the midst of paying off their student debt; while a lack of knowledge in others has made them think they have a lot of time before they need to worry about retirement. The way people currently invest doesn’t appeal to this generation. You’re a part of the biggest generation in history, and it’s because of this you hold the potential to have as much, if not a greater, influence in shaping economic trends as your predecessor generation had. But you don’t have to look like the investor of the past. You can be the face of the new-age investor, one who is financially-savvy and engages in smart investing, looking to alternative options for investing money rather than settling for traditional methods. The economy may always be uncertain, but that doesn’t mean you should be. Be proactive with your wealth. If you don’t trust a faceless man in a big firm managing your finances, take ownership of your own financial portfolio. Are you ready to overcome your investing fears and shape a new financial future for yourself? 1 min Learn what past participants had to say about algorithmic trading and machine learning with the Oxford Algorithmic Trading Programme.